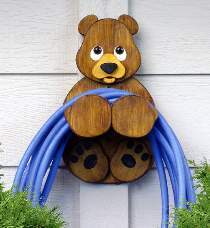 Holds up to 75 feet of garden hose. Easy to make from 3/4" stock. All patterns drawn FULL SIZE. Measures 19"H. Order three wood dowels and one pair of brown eyes separately below.